Sat:22:Dec:12 - 808 State Live - The Warehouse Project - Victoria Warehouse - Manchester. 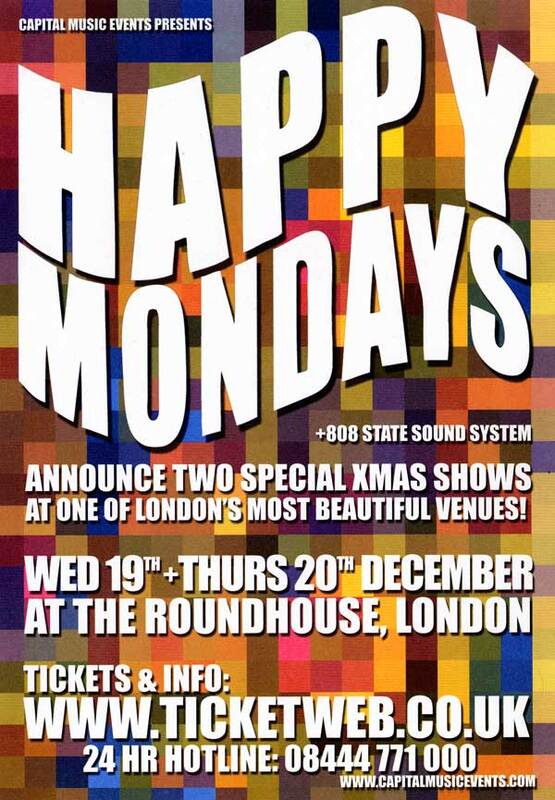 Wed&Thu:19&20:Dec:12 - 808 State DJs - Roundhouse - London. 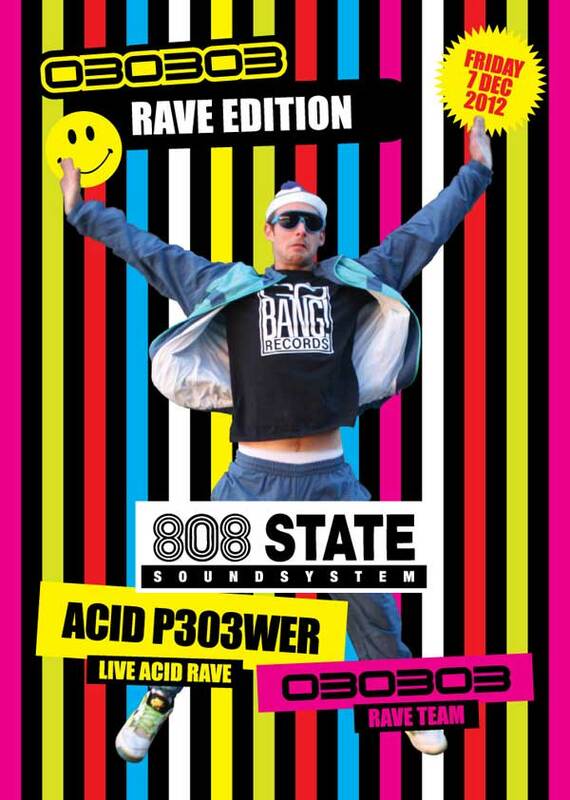 Fri:07:Dec:12 - 808 State DJs- 030303 Rave Edition - The Netherlands. 26/28/29:Nov:12 - Graham Massey @ The Roland Synth Story - various locations. Fri:30:Nov:12 - 808 State DJs - The Brighton Centre - Brighton. Cancelled! Sat:17:Nov:12 - 808 State DJs @ Culture One Festival - Bangkok - Thailand. Sat:10:Nov:12 - 808 State DJs @ Hacienda30 - Mint Warehouse - Leeds. Sat:10:Nov:12 - Graham Massey @ Un-Convention 2012 - Hulme, Manchester. Also features the unreleased documentary film 'Nish, Clish, Bangin: The MC Tunes Tapes' (Introduced by Director Howard Walmsley and Nicky Lockett). MC Tunes will also join Al Fonso for an exclusive MVITA performance! Sat:27:Oct:12 - A Guy Called Gerald & Graham Massey live analogue Rebuild set - Fire - London. Sun:26:Aug:12 - 808 State DJs - Asylum - Hull. Sun:25:Aug:12 - 808 State DJs - VIVA @ Projekt 42 - Manchester. Sat:18:Aug:12 - 808 State Live - Wowfest - Isle of Wight. cancelled. Sat:04:Aug:12 - 808 State DJs - The Picturedrome - Northampton. Fri/Sat:27/28:July:12 - 808 State DJs - Beatwolf @ Kendal Calling festival - Hackthorpe. Sat:30:June:12 - 808 State DJs - Hacienda30 @ The Arches - Glasgow. Sat:09:June:12 - 808 State DJs - Hacienda @ Space - Ibiza - Spain. Mon:04:June:12 - 808 State DJs - Hacienda30 hot Classics @ Sankeys - Manchester. Other flyer. Sat:02:June:12 - 808 State DJs (not a live show) - Soundcrash Warehouse party - London. Sat:26:May:12 - 808 State Live & 808 State DJs - Insanity @ Bowlers - Manchester. Other flyer. Mon:21:May:12 - 808 State DJs - Hacienda30 @ Hacienda Apartments Car Park - Manchester. Other flyer. Fri:18:May:12 - DJ Daz Partington - CHEWN! in aid of The Christie @ Sound Control - Manchester. Sat:05:May:12 - 808 State Live - Birkenhead Park Music Festival - Birkenhead. Postponed, new date tbc. Fri:13:Apr:12 - 808 State DJs - Hit & Run @ Club HQ - Glossop. Sat:03:Mar:12 - 808 State DJs - Bumper - Liverpool. Fri:27:Jan:12 - 808 State Live - Village Underground - London. Click on flyer for tickets.